Oprah-approved designer and fledgling talk show host Nate Berkus is selling his 3-bedroom condo in the historic Chicago Gold Coast neighborhood for $2.39 million (it was originally listed at $2.65m but was recently reduced). It’s in a small, “vintage” 12-unit building built in the late 1920s, and was featured in Elle Decor. Because “The Nate Berkus Show” tapes in New York, he’s been spending more time out there than in Chicago these days. 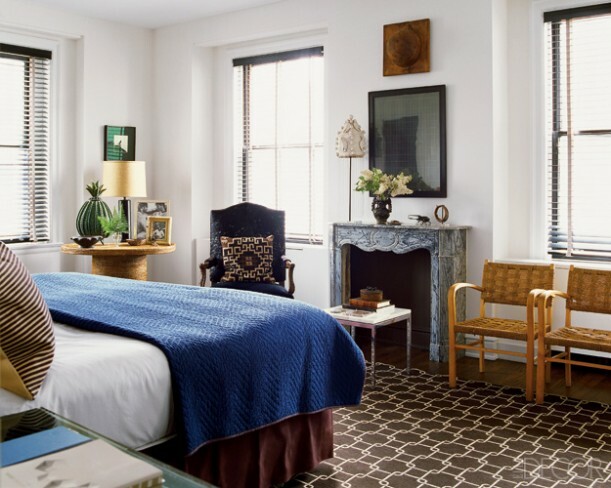 He mentioned his small one-bedroom apartment in Manhattan’s West Village neighborhood on “Oprah” back in 2008. The kitchen still has its original metal St. Charles cabinets, and I have to say I love that they weren’t ripped out anywhere along the way. With the desk-like table and schoolroom chairs in the kitchen, though, it gives off the vibe of a teacher’s lounge in an old city school, doesn’t it? The condo was first renovated in the 1940s by architect Samuel Marx, and the original fireplace and paneling that he installed are still intact. Zillow reports that Nate just bought a $3.35 million co-op in NYC. It doesn’t look like his style to me, so I wonder how he’ll Berk-ify it? You can see the photos here. Public records show he bought the nearly 4,000 square-foot condo in 2003 for only $500,000, but Crib Chatter insists that must be a typo. They believe it was actually $1.5 million. Some of the improvements Berkus made include a kitchen backsplash with the white subway tile he’s always touting on his talk show, new hardwood floors, and a rehabbed master bath that has a custom English tub. Have you been watching his new show? The best thing about it has been getting to see some of my favorite bloggers on it in his “House Proud” segments. Do you like Nate’s style? You can see the rest of the photos at Elle Decor and the listing. Hmm, beautiful place! I especially like the rough wooden furniture. Gorgeous! Isn’t it a beautiful place? Too bad everything really beautiful will be gone after you buy it. I love the closet and kitchen table. It is beautiful. But it is missing someting. A little “oomph” a little showstopper. I can’t say what, but I expected more. I totally agree with your Yvonne, I don’t know what either, I kinda expected more too. Maybe it’s as simple as a man’s space, designed for a man and we just don’t get it ? I think you’re right. It’s very masculine and sorta cold. It doesn’t have the warmth of feminine energy. Very nice, but I am still swooning in ecstasy over the Beach House with the Blue Shutters. I may never recover Julia! I can´t help myself, something is missing here. It´s stylish and everything is arranged perfectly. It´s probably the excesive ambition to be perfect that evokes these feelings of artificiality and lack of life. It does look like a few pieces were photoshopped! That’s funny! Great pick up …. I had to go back and look and you are right – they are so photo shopped – even the stool in front of the tub. Looks like a really nice place but it seems almost too staged. It’s too perfect. Doesn’t seem to have a lot of architectural detail you would expect from a building that age. Love that tub however! I so wish I had room for something like that in my bath. Wow! It looks like that New York apt. has a lot of potential to be Berk-ify. I can’t wait to see what he does with it! Hey there Girlfriend…..been out West visiting my kiddos and Grand Furbaby lol . I hope you had a nice Mother’s Day…. I love Nate…..not so much his style, perhaps if I were single and a guy….but I do love his NY apt……love those stairs…… I taped that Oprah show just so I could see her pad….nice teahouse LOL I was so disappointed !!! Just a little glimpse of her dog giving her some tongue in her kitchen YIKES !!!! OH MY, that BATHTUB?!!! LOVE! And I think the kitchen is awesome too. Thanks for sharing this! I had the opportunity to meet Nate last week — I enjoyed seeing the photos of his home! I don’t know why people are snarky about his style? His home looks great. Obviously it is staged for selling and photographs, but it looks like a real home with real style to me! OMG. You actually met NATE. I Love him so much. Watching his show is like my religion. I love his style. I have tried to do my house in his style. I wish he would come to Australia. I love him so much. I love that he left the original kitchen cabinets — it adds a lot of character — and the industrial style table and chairs are a great touch. I think a lot of people feel that over all the apartment doesn’t “feel” right because the scale of several of the furniture pieces is off, possibly because many of the real furnishings have been moved out already? I think it’s great! It looks like a masculine place–which makes sense, considering a guy lives there. 😉 Loved seeing the photos! Doesn’t he still have his design firm in Chicago? Or does he not really do that anymore, haha? And about that “tour of Oprah’s Montecito home” – I couldn’t believe they advertised it as that. It was nothing. I was not impressed. Love the kitchen, dining area, and the bathtub. But those rugs? Umm… no. I like it, it’s got quite a masculine feel to it but beautifully done – i’d snap it up! The hating is weird to me too! Even though I would say that most of the decorating is not to my taste, I would never say it was “bad” decorating. I think that not everyone can draw that distinction, perhaps? There are things I do and don’t like about this condo, but Nate’s style isn’t horrible. Other designers you’ve featured in the past, had horrible taste. I love that bathroom, it’s very nice. he is soo cute…i like his style too. I love it.. I love his show as well. Always has great tips for everything.. nice place!! I don’t find anything so special about his place and feel anyone can put together rooms as he did. So much for being a designer. 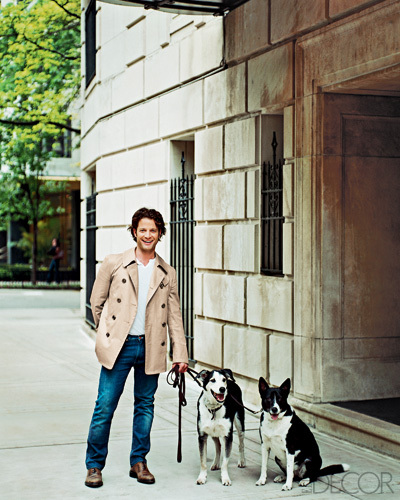 His blue eyes and pretty face have taken Oprah’s pet pretty far indeed. I like the place. 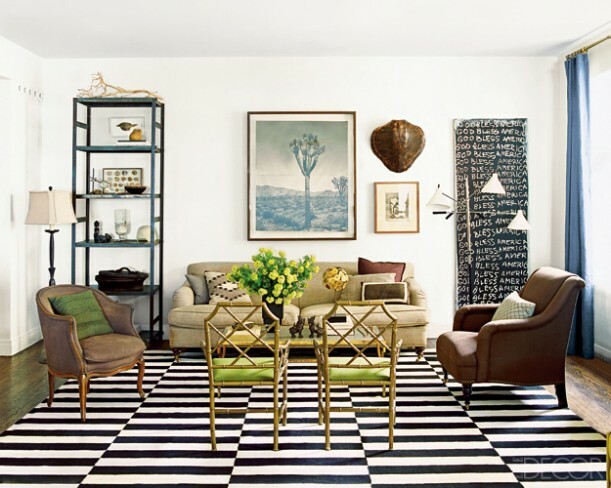 I like how eclectic it is and I think it feels like an apartment you could really live in. I think it’s really great. That rug in the living room makes my eyes go buggy! Eww- the kitchen leaves me cold- the table and chairs are depressing and the wrong scale….gorgeous light fixture and the vintage St. Charles cabinets are the “real”- real estate though. I think it would show better if the table and especially the chairs were replaced with something a little more grounded. The den is ugly, and feels neglected. 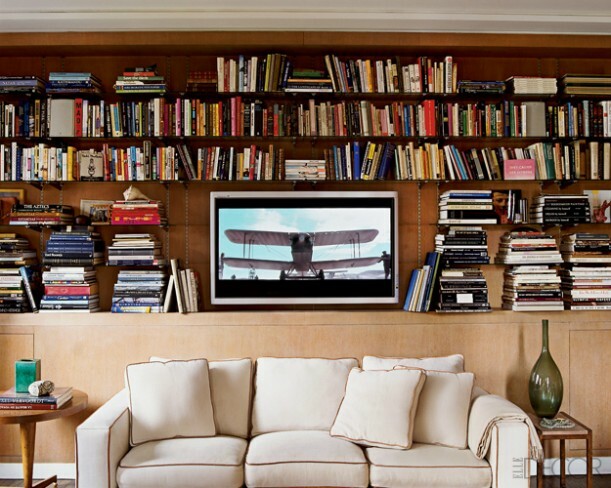 It reminds me of every suburban Brady-bunch family room from the 1970’s -too many books!!! !- any agent would tell a client to edit- edit- edit so the prospective buyer can picture themselves there. The bathroom is outstanding…the closet- well, try again on the color palette. The entire tour feels cold perhpas the pictures were taken on a typical Chicago gloomy winter day…some bright lighting or punches of color could take this a new direction and give it a little sizzle. I feel they might be relying on the provenance a little too much…do the real estate basics and edit accessories, add some light. That being said….I would buy it in a heartbeat sans school room table and chairs. I think it’s gorgeous and interesting and eclectic and warm. I always love Nat’s use of navy/dark blue. It’s such a great, underused color in home decor, if you ask me. This is a beautiful house!! Would love to live there!! I watch Nate alll the time and never heard he was cancelled. What more do people want? He has personalities, recipes, ideas, etc, I like his makeovers. Sometimes he interupts guests a little too much/ . They cancelled many s oaps…pretty soon I won’t bother to turn on the TV at all. It’s really too bad about Nate’s show. I thought it was well done. I was actually a guest on his show once. He is warm, charming and extremely cute. I love the Nate Show and watch or tape it every day!!! I love the fact that he incorperated so many other elements into his show to let people see how home design mixes into all aspects of your life. OWN could always use another new show! Finally, I have time to catch some daytime shows (after I retired) and now its cancelled. I love the show—decorating tips, recipes and style tips, and not just for 30 something age, but us “Mature” ladies!!!! Thanks Nate, it was great for a while!! I am so upset to learn that the show was cancelled. I am a big fan and never missed an episode. Maybe this is NBC’s loss and Oprah’s gain. Nate, I wish you the best and I will miss you. Underwhelming. I’ve never been a fan of Berkus’ and have long felt that he parlayed his legitimately sad story into a career he didn’t entirely deserve (with Oprah’s and mommy’s help). As a designer he’s talented but not so much more so than many others. Quite frankly – much of his work is based too much on trends established by others – he just isn’t terribly original. I’ve seen a number of rooms he’s designed that look one step up from a J.C. Penney catalog. No – I’m not hater – I just don’t get him. As for his show – like his designs it was far too derivative and he came off as too slick, too “camera ready” – without an iota of spontaniety. Sorry folks – I just feel he’s one more example of our culture elevating people to ranks they don’t deserve and then imbuing them with qualities they either don’t have or can’t support. My 2 cents. So sorry to see this show cancelled. I was finally making the time to see it everyday. Hope to see Nate in something else very soon! So sorry to see his show cancelled.Enjoyed it every day had so much on ithis show,something for everyone. Will not be watching the new show,tv has so many talk show on we don’t need any more. I liked the washing area of this bathroom. Moreover I liked the shape of it. How come I didn’t know until today that Nate’s show has been cancelled? We really don’t need another talk show host interviewing people who have lost mega pounds. Ricki tried it once before and it didn’t last. NBC — I will not be watching. Hurry back Nate. Maybe OWN or HGTV. More home design and less people design needed. I was truly surprised that Nate was cancelled! I didn’t hear even a hint of it!! I loved his show and I liked him very much also. He is so talented and I have done some decorating myself, based on things I learned from watching Nate. He is a lovable, likeable, guy and will be missed. The down side was the cooking segments. So many have that, and I didn’t care for it, especially since Nate always said that was not his thing. It didn’t seem to fit into his show. I could watch his decorating ideas for the entire show! Didn’t like the game playing either. It just doesn’t fit. He will be missed by me and many others! Maybe we will see him immerge at another time!! Hope so!! Good Luck Nate!! We love you!! I am just sick that Nate has been cancelled. I scheduled my lunch around his show and enjoyed him so much. Hopefully, he will be picked up by another channel – he’s too talented not to share his talents with others. The blue bedspread in the bedroom with the brown tile floor seems exactly the same as is used by movers when they wrap and protect the furniture. I would never have thought to use those as a comforter. I will miss the Nate Berkus show….i learned so much. I took something away from each segment and used it on my home decor, my.cooking and my.fashion sense and buying power. I have changed.the way i spend money on every aspect of my life and i.dont ever sacrifice style and taste. THANX NATE YOU CHANGED MY LIFE.FOR.THE BETTER. I will.miss you and will looking for u again. i’m so sorry i wont see you on your show anymore, i learned so much with you just watching your show .but i know something will happen and you will come back on tv good things happen to good people, and you are one of those such a gentle soul with so much love n you any can forget that you are a bit demanding i think but i love you as a designer and i wish you only the best, hope to see you next year at a different time. I am so disappointed that the Nate Show was cancelled. I really loved it! It was practical and inspiring. And since I don’t have cable, I was thrilled to find a design show on network TV. Hope it comes back even better than before! I will truly miss you. Your show was just wonderful and you made everyone feel wonderful. You have a real creative flare and I hope your next adventure is well received and appreciated. Everytime I watched your show I felt ‘oober’ motivated. I could not believe there were always more and more amazing decor ideas. I am a creative person and felt a real kinship with you.